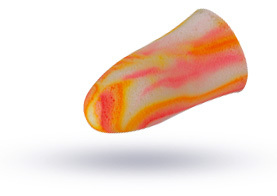 Cool, brightly coloured soft foam earplugs ideal for parties, clubbing, concerts and sports. Effective noise blocking earplugs. Protects your ears from loud music. Easy to use. Made from skin-friendly foam that gently expands inside your ear for a perfect fit. Re-usable and packed in a small, clear carrying case. Easy to open and share with your friends. Stand out in the crowd with these bright, fluorescent coloured earplugs effectively designed to protect your ears from noise and loud music at parties, concerts, leisure activities and sport events. Ohropax Colour are made from soft PU foam that gently expands inside your ear canal for a perfect fit. Ohropax Color earplugs effectively insulates noise across the entire frequency range. Superior, reusable earplugs suitable for blocking out irritating and harmful noise. 1. Roll the earplug between clean fingers into a tight cylinder. 2. Pull the ear slightly upward with one hand and insert the rolled earplug deep into the ear canal with the other. 3. Use a finger to hold the earplug in place until it has expanded and is in a secure and comfortable position. The earplugs can be easily cleaned and used up to five times. To clean, use a mild soap solution to rinse the earplug and leave them to air dry completely without wringing. Store away from heat and direct sunlight. Product information "Ohropax Color Earplugs"
Packaging: Ohropax Colour earplugs come in a handy transparent plastic case with 10 earplugs (5 pairs) inside. Materials: Made from polyurethane expanding foam with a special surface texture to improve the fit. Related links to "Ohropax Color Earplugs"
Customer Review for "Ohropax Color Earplugs"
Excellent ear plugs, which I've now been using for years. Many other makes are either the wrong shape, or more importantly don't have enough density to block out the noise. Can't go wrong with these. The best I've come across.